Here are reports of the events we enjoyed during summer 2017. 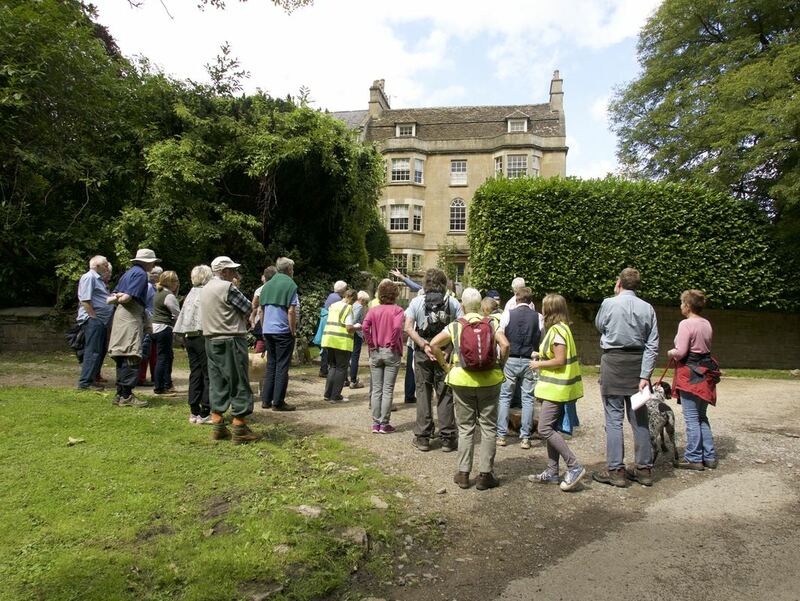 On 16th August a merry coach load of NATS and friends set off for Sudeley Castle. The day was dry which was a bonus in this rather unpredictable summer. Elizabeth 1 also visited the castle. The castle is also a home to the current owners who live in the family apartments and the family is actively involved in the day to day running of the castle and estate. The castle is surrounded by a breathtaking 1,200 acre estate and ten award-winning gardens. There are many exhibitions and short videos which reflect the history so well. Sadly many of these are on upper floors which make it inaccessible for the less mobile. The spirit of the 15th century Banqueting Hall is captured among its romantic ruins (pictured). Roses clothe the walls and a gothic window is curtained with Clematis Montana. We thanked our coach driver for so ably negotiating the difficult and narrow approach to and from Sudeley Castle. The amount of history in Box is truly remarkable and another summer of walks, organised jointly by Box NATS and Box People and Places, brought forward some amazing discoveries. The first walk was at the Old Jockey area to explore the remains of the Roman Road, part of Via Julia from Mildenhall (Marlborough) to Bath, which still forms the southern boundary of the parish. The road was mentioned in a royal charter of 1001 but fell into disuse until it was rediscovered in 1819 by the antiquarian Sir Richard Colt-Hoare. We explored a geological fault line with rocky brash soil on the Box side and sandy soil on the Bradford side. The road marks the last field in the Cotswolds in Box parish. We made several unexpected discoveries. We uncovered a series of stones, potential standing stones, hidden away in a coppice and determined to investigate further. We talked about the 100 acre field which was used in World War 2 to resemble a bomb-pitted Colerne Airfield. The walk concluded with tea and cake and a display of Roman coins by Richard Jeffery and of finds on the Roman Road. 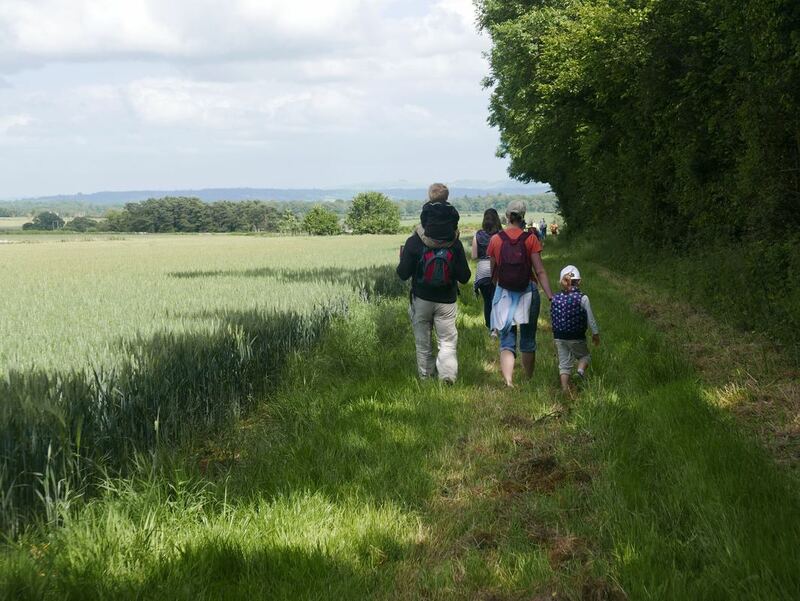 The walk along the Roman Road, above, attracted people of all ages to explore one of Box's oldest man-built structures. 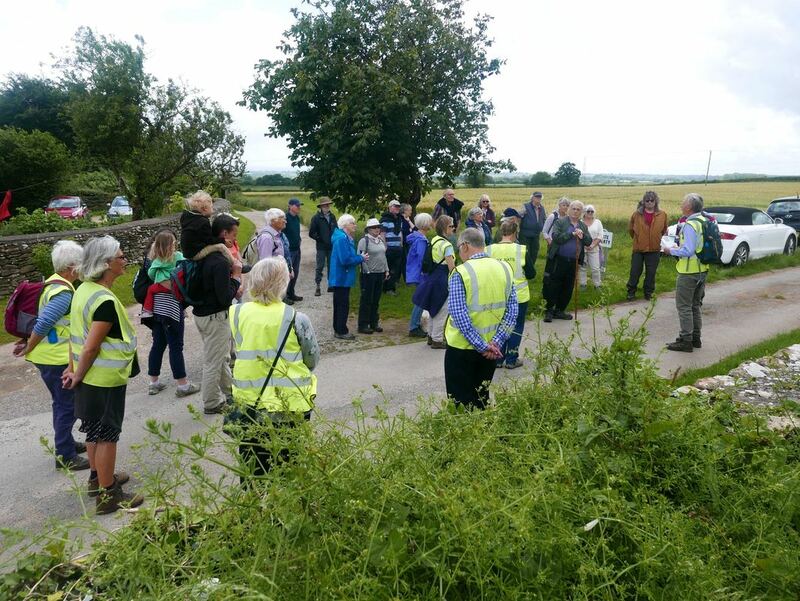 The second history trail was introduced by Steve Wheeler from Box Hill, led by Viki Hess from Rudloe and concluded by Dave Wright of Box Parish Council. In 1976 local people feared the residential development of Box Hill Common by builder George Lacy when the land was refused as common land. Steve Wheeler formed the Box Hill Common Protection Society to prove that the area did qualify as waste of the manor. A public meeting at the Selwyn Hall in 1978 resulted in 300 villagers attending. After a heated debate George Lacy made a generous proposal to sell the land for £3,000 which Box Parish Council funded by a two-year precept on the rates. Under the leadership of Viki Hess we were treated to a fascinating exploration of the site today, the species to be seen on the limestone grassland meadow on the common, Pyramidal Orchids, Wild Marjoram, Bird's Foot Trefoil, Rock Rose and Ladies Bedstraw. She emphasised the area's importance and the need for maintenance to remove invasive species and Japanese Knotweed, particularly in the lower common. The final trail for 2017 traced the evolution of Georgian Middlehill on a coaching route from Bath to London. John Neate, a Bristol Merchant Venturer, who made a fortune bringing candle wicks from the Baltic, redeveloped Middlehill House and Miss Katheen Harper lived there in 1950s, remembered by locals as the first lady mayor of Bath, chairman of English Folk Dancing Society, and chair of the Church of England's Waifs and Strays Society. Middlehill Spa was one of 31 spas built in Wiltshire. Dr William Falconer of Bath claimed medicinal qualities for local water in 1786 and built a leisure resort there together with a local baker, Mr West. The Spa failed and by 1793 was put up for sale. We enjoyed a break when we reached Ditteridge with a sit-down in the Church and a fascinating review by John Ayers of the history of St Christopher's. Outside we found out about The Bungalow, the oak tree planted in 1910, and the Anson Northey memorial cross. The walk concluded with a wonderful tea at Ardgay House courtesy of Peter and Anastasia Hatvany and a review of Thomas Woodgate RN, the man who built the house in 1863 and one of the first One Nation Conservatives in England. Above left: We investigated the history of the Georgian Spa at Middlehill and Right: the story of St Christopher's, Ditteridge, from Canon John Ayers. 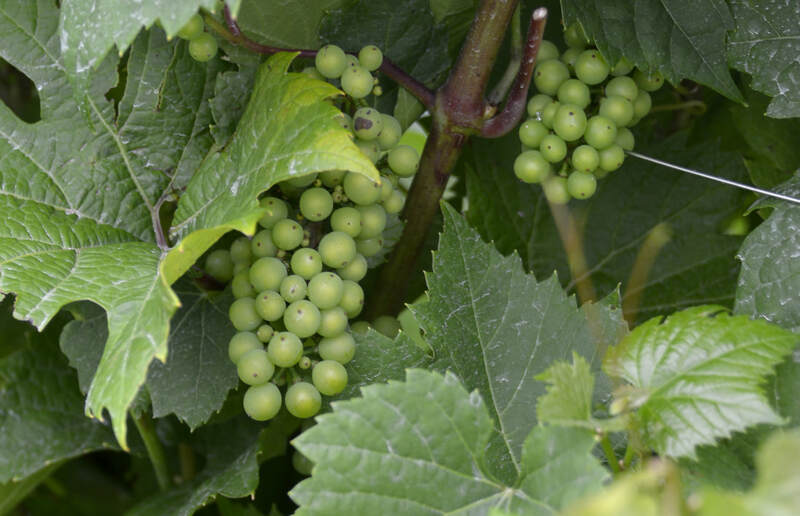 Why search the world for truly good wine when we have a fully-fledged winery on our doorstep? Tony and Margaret Cox are not only the owners but also overseers of the entire process from choosing the vines to be planted through to bottling. Their most crucial judgement is about precisely when the grapes are ready to be harvested. This requires experience as well as Science. The grapes we saw on our visit were growing low down on the vines and ‘setting well’. Above them this year’s abundant growth of half an inch a night was about to be pruned. The vineyard is on a South facing slope, with the Triomphe d’Alsace grape producing red wine planted at the top and Madeleine Angevine and Reichsteiner grown at the bottom for white. Propagation is by rooted cuttings and pollination wind-driven within the crop. One of the family’s greatest successes was the order of two cases of Mumfords Red for HMS Victory’s 200 year celebrations in 1995. No watering is needed as the vineyard is naturally irrigated by streams descending from the hills behind. A small number of workers come when required, two experienced local people and regulars from Glastonbury. No insect pests means no insecticides but mildew is sprayed with sulphur, supplemented with a little Miracle Grow. Wildlife includes deer which do not eat vines and the rabbits which do are seen off by local cats. Badgers which like to sit on their haunches eating the grapes above are mostly kept out by a low volt perimeter fence. Last year Tawny Owls bred in a nest box but this year it was taken over by rare Stock Doves. Our tour of the vineyard was made particularly enjoyable with Tony interspersing details of viniculture with amusing anecdotes. Back in the winery we tasted wines with a refreshing clean taste and subtle bouquet, explaining why this business is so successful and attracting new customers like hen parties. The considerable clanking noise accompanying the return to our cars was witness to our group’s appreciation. A balmy June morning and after we had settled comfortably in our coach, John Chandler, our vice-president unveiled his mystery tour for 2017 and handed round relevant maps. Imagine, he said, what it would be like to be a peasant living in a mediaeval village. We were to be taken to such a village (a reconstruction) at Cosmeston Lakes near Penarth in the Vale of Glamorgan. On arrival, after a reviving coffee or ice cream and a brief walk to look at the lakes and wild life we gathered at the entrance to the village and divided into two groups to be shown round by the Reeve and the Mistress of the ale house. The existence of the village had been discovered in 1980 and some of the buildings excavated had been authentically restored, using stone, mortar and thatch. These included a baker’s house and his ovens attached to another poor cottage, a Reeve’s cottage connected by a byre to a peasant’s cottage, a stone pig pen and swineherd’s cottage, a large tithe barn and herb garden. Although the situation of the lord’s manor house is known it has not been unearthed. About 100-120 inhabitants were thought to have lived here, the lord owning everything, including the bonded slaves (about half of the residents). Everyone worked for the lord. He and the Reeve (village organiser) were the only people able to read and write. The bond slaves, on the whole lived a pretty miserable existence, never eating meat and living mainly on rough bread, turnips and poor beer. The freemen did slightly better and the lord did very well indeed. Although a church has not been found there must have been one, certain church relics were in the tithe barn and the village folk would have enjoyed their few days off work celebrating the Christian festivals. Light relief was also to be found in the alehouse. As well as the ale, customers were given board games to play to encourage them to stay and drink more and since we were in Wales, presumably there would have been singing. 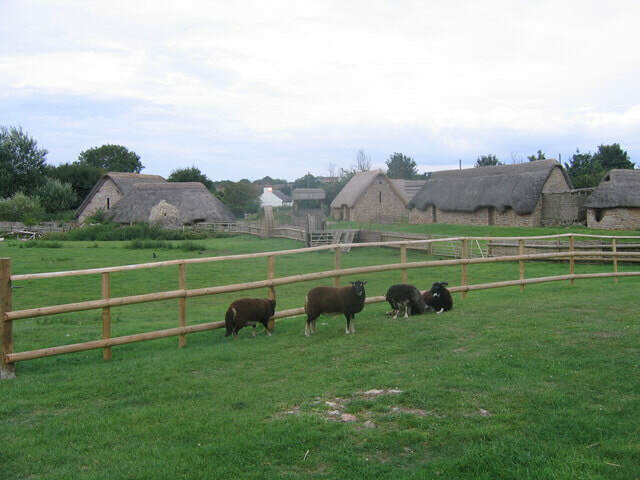 After the Black Death which had such a devastating effect on the population (two thirds succumbed in some areas) the peasant’s lot improved as they were in great demand and eventually all were given free status. Many questions were raised and answered by our very knowledgeable guides. We certainly felt we knew what it must have been like to have lived in these times. 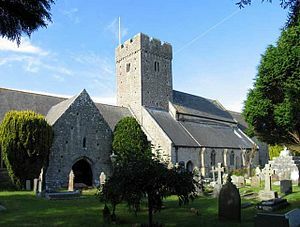 We then moved on, armed with our maps of 1790 and 1917, to Llantwit Major. Our aim was to navigate the narrow streets to the church founded by St. Illtud in 508 AD as a church and centre of learning, probably the first university in GB. Our guide explained that the wooden church was destroyed and rebuilt by the Normans around 1100. During the 13th century a Galilee chapel was added to the western end and around 1300 a tower and another chapel was built to be used as a monastic chapel. Wonderful wall paintings and carvings were added. Some of the paintings are still to be seen. The Galilee chapel has been restored and now houses a collection of Celtic crosses. In the grounds are a 13th century gatehouse and the monk’s pigeon house. The elongated church with its four distinct styles of building makes a unique picture. Before returning home we travelled further west to see the beautiful scenery of the Ogmore estuary and valley. We arrived home tired but amazed at how much we had seen and learnt in one day, with many thanks to John and a promise of another mystery trip next year. Batsford Arboretum is a short distance West of Moreton-in-Marsh in the Cotswolds. Situated on a hillside with far-reaching views over the countryside, it is a place of great beauty and tranquility. The Batsford Estate was inherited by Algernon Freeman-Mitford (later Lord Redesdale) in 1986. In the 1860s, Algernon worked for the Foreign Office in Russia, Japan and China. He fell in love with the oriental countryside. Later he worked for the Ministry of Works which was responsible for Kew Gardens, where he gained horticultural knowledge. After inheriting the Batsford estate, he overhauled the grounds, creating a wild garden influenced by his memories of China and Japan. He planted many oriental trees and built a 600 metre water course on the Western side, crossed by several oriental-style bridges. The gardens included a hermit’s cave, thatched cottage, Japanese rest house as well as exotic statues such as Buddha, two Japanese deer and a “Foo” dog – a mythical beast. The estate was sold after the first world war and was bought by Gilbert Wills (later Lord Dulverton). In 1956, it was inherited by his son, Frederick, who revived the garden and introduced many rare and beautiful trees. Since 1992, the arboretum has been run by a charitable trust. There are beautiful trees to admire as one follows the various paths around the arboretum. 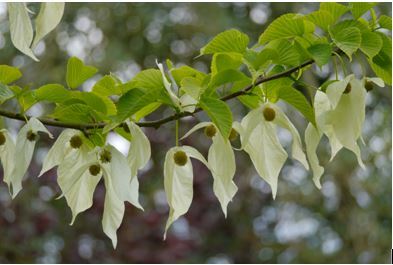 During our visit, the star was the magnificent “handkerchief” tree, as shown in close-up photograph. Our first outing of the summer saw a coach full of members heading off to Llantrisant, Cardiff for a visit to the Royal Mint. We started with a short video presented by Dan Snow . He invited us to guess the number of coins which were minted there. We were all a long way out, the answer was 90 million a week. We were shown the various metals used and how different methods were used to deter forgers. such as the inclusion of different metals and wording and milling around the rim of the new £2 coin. From the viewing area we watched the various machines stamping out different coins. They produce them for countries all around the world as indicated by all the national flags displayed around the room. One coin shown to us was a square one for a South American country. 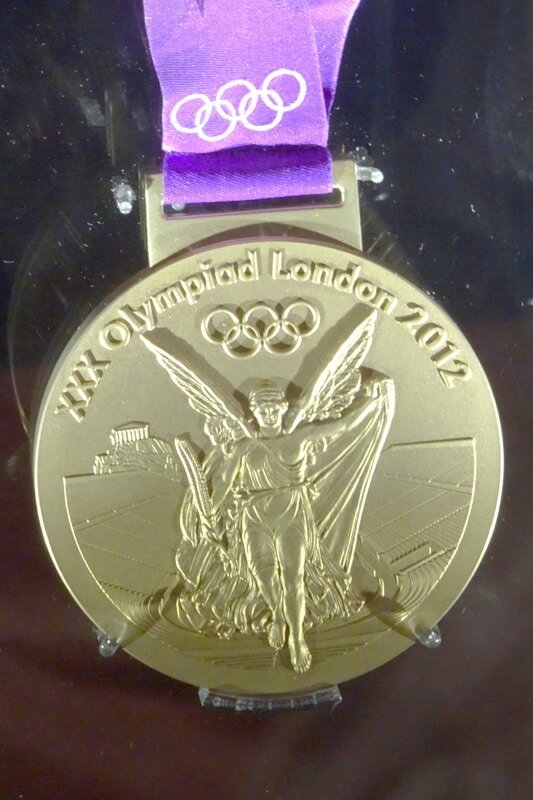 The warehouse was pointed out to us where earlier in the year 1.9 billion coins had been housed. Our guide informed us that a competition had been arranged for the design of the new £1 coin, which was won by a fifteen year old schoolboy. Next time you see one have a look at the detail in the design before you spend it. The mint was transferred from Tower Hill, London to a green field site at Llantrisant in 1966 as the present site was unable to cope with the production of the enormous quantity of decimal coins need by D day. It was opened by Her Majesty The Queen in 1968. The last part of our visit included a stroll around the museum which houses copies of all the commemorative coins minted over the years together with military medals and the 2012 Olympic medals. We all agreed that this is a place everyone should visit as it was a fascinating and extremely interesting place. If you intend to go, I would suggest you book in advance as tours are limited to 25.